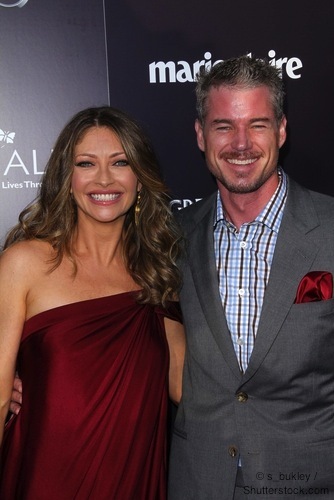 Rebecca Gayheart and Eric Dane: It's a Girl! Rebecca Gayheart, actress and wife of ‘Dr. McSteamy’ (Eric Dane), has given birth to a baby girl. This is the second child for the couple who are also parents to 20-month old Billie Beatrice. Gayheart, 40, gave birth just in time for New Year’s, on December 28, 2011. The couple confirmed the reports to PEOPLE with the news that they’ve named their daughter Georgia Geraldine Dane. A representative of the actress also broke the good news that "both mom and baby girl are happy and healthy, Billie is thrilled to be a big sister, and dad is getting ready to live in a house full of ladies!" The couple announced their pregnancy in July, just a week before Eric Dane, 39, checked himself into rehab. The Grey’s Anatomy star was reportedly suffering from addiction to painkillers, which he was prescribed due to a sports injury. Fortunately, the onscreen doctor was back to work shortly thereafter and is reportedly doing well. Gayheart admitted that with her first pregnancy, things were a bit different. “I was micromanaging everything I was eating and every little symptom I was feeling,” she said, “and this pregnancy I just know everything’s okay.” She was right! We can’t wait to see the first photos of the beautiful bundle and congratulations to Rebecca, Eric, and big-sister Billie!